The US National Security Agency has spied on French diplomats in Washington and at the UN, according to the latest claims in Le Monde newspaper. The Le Monde report sets out details of Genie, an NSA surveillance programme in which spyware implants were introduced remotely to overseas computers, including foreign embassies. It claims bugs were introduced to the French Embassy in Washington (under a code name "Wabash") and to the computers of the French delegation at the UN, codenamed "Blackfoot". The article suggests that in 2011, the US allocated $652m (£402m) in funding for the programme, which was spent on "spy implants". Tens of millions of computers were reported to have been hacked that year. A document dated August 2010 suggests intelligence stolen from foreign embassy computers ensured the US knew ahead of time the positions of other Security Council members, before a UN vote for a resolution imposing new sanctions on Iran. The US was worried the French were drifting to the Brazilian side - who were opposed to implementing sanctions - when in truth they were always aligned to the US position, says our correspondent. The intelligence agency quotes Susan Rice, then-US ambassador to the UN, who praises the work done by the NSA: "It helped me know... the truth, and reveal other [countries'] positions on sanctions, allowing us to keep one step ahead in the negotiations." On Monday, Le Monde alleged that the NSA spied on 70.3 million phone calls in France between 10 December 2012 and 8 January 2013. 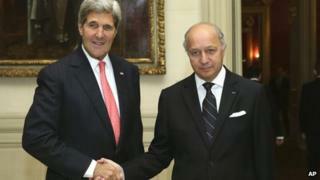 At a breakfast meeting with the US secretary of state on Tuesday, French Foreign Minister Laurent Fabius demanded a full explanation. Asked if France was considering reprisals against the US, government spokeswoman Najat Vallaud-Belkacem replied: "It is up to Foreign Minister Fabius to decide what line we take but I don't think there is any need for an escalation. "We have to have a respectful relationship between partners, between allies. Our confidence in that has been hit but it is after all a very close, individual relationship that we have." Both French officials made their comments before the latest revelations appeared in Le Monde. Mr Snowden, a former NSA worker, went public with revelations about US spying operations in June. The information he leaked led to claims of systematic spying by the NSA and CIA on a global scale. Targets included rivals like China and Russia, as well as allies like the EU and Brazil. The NSA was also forced to admit it had captured email and phone data from millions of Americans. Mr Snowden is currently in Russia, where he was granted a year-long visa after making an asylum application. The US wants him extradited to face trial on criminal charges.